The mission, vision, and programs of the Brethren & Mennonite Heritage Center (BMHC) are carried out by the Board of Directors, an employee of the board, and a large team of dedicated volunteers. The Executive Director reports to the board of directors and coordinates with volunteers, overseeing the operation, maintenance, and development of the Brethren & Mennonite Heritage Center — its campus, artifacts, programs, and sustainability. Greg Yoder grew up the son of a Mennonite pastor in southeastern Pennsylvania. After graduating from a Mennonite high school (Christopher Dock) and Mennonite college (Goshen College), Greg began teaching elementary music in Rockingham County and performing with the Walking Roots Band. In 2016, president of the BMHC board, Beryl Brubaker, and then-director, Joan Daggett, approached the Walking Roots Band about the possibility of being involved in a new music festival on the Brethren & Mennonite Heritage Center campus. Greg got involved in the planning of the music festival, and he was impressed by the dedication and passion of the many volunteers connected to the Brethren & Mennonite Heritage Center. Since he came on board as Executive Director in 2017, Greg has continued to be impressed by the passion, vision, and commitment to sharing the legacy of faith on the part of volunteers, donors, and supporters of the heritage center. In addition to doing all manner of things in his role as director, Greg enjoys working around the farm with his wife and two children, hiking, biking, and making music with the Walking Roots Band. Martha Reish is a retired educator (and educator of educators), most recently as professor of preservice teachers at James Madison University. Martha oversees and coordinates the school field trip program at the Brethren & Mennonite Heritage Center, scheduling schools, costumed presenters, volunteer guides, bakers, and more. The field trip program always receives rave reviews, in no small part thanks to Martha’s meticulous planning and passion for hands-on learning experiences for children. Martha is always happy to learn of newly interested prospective volunteers, so send her a message today to find out how you might help out with field trip season. When she’s not coordinating field trips for the Brethren & Mennonite Heritage Center, Martha and her family are building a house and running a number of farm-based businesses in Broadway, VA. Locals or guests in the area during late May-early June are encouraged to visit Martha and her family during berry season at Broadway Berries. Ervie Glick is a jack-of-all trades, and he spends many hours volunteering his time to beautify and maintain the campus and buildings of the Brethren & Mennonite Heritage Center. Before retiring, Ervie was a professor of German at Eastern Mennonite University. In the years following WWII, Ervie served two years in Germany with PAX doing 1-W service, and during this time he learned the skills of a stone mason. 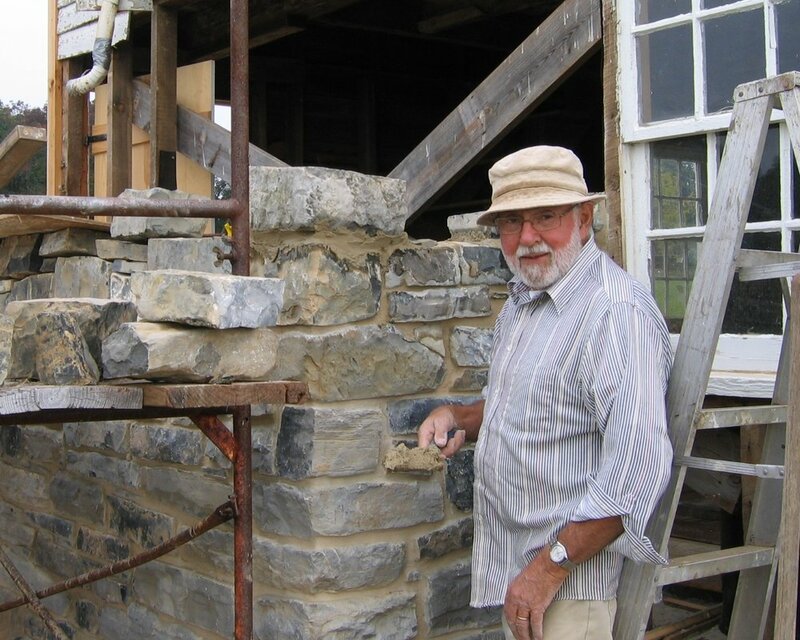 Visitors to the Brethren & Mennonite Heritage Center will appreciate Ervie’s stonework on the shoemaker shop and log house. Maintaining historical buildings provides much work for skilled tradesmen, and Ervie is always thrilled to learn of interested volunteers. Additionally, Ervie employs a team of volunteer mowers, landscapers, painters, and cleaners to keep the campus looking nice. Contact him today to learn how you can contribute to the efforts of maintaining the facilities and ground of the Brethren & Mennonite Heritage Center. Beryl Brubaker is professor emeritus from Eastern Mennonite University and has served as president of the board since 2011. Beryl chairs numerous BMHC committees, and she regularly thinks about ways to strengthen and develop the programs of the Heritage Center. Beryl was and is the driving force behind the Sing Me High Music Festival, serving as the Incident Commander and one of the chief planners.